Ahmedinejad may have the theocracy government to back his Presidential campaign, but Mousavi has something much more sentimental: The Youth. He has started the “Green Movement” which –No, not a green energy campaign– But Green, as a symbol of reconstruction, of change. Now, if you go about trying to google pictures of rally it’s virtually inexistant. This may have something to do with Ahmedinejad’s method of blocking certain websites, such as facebook and myspace, which are primarily used by young people. It is because of this that young voters have a more difficult time assembling rallies and such because of the lack of communication. 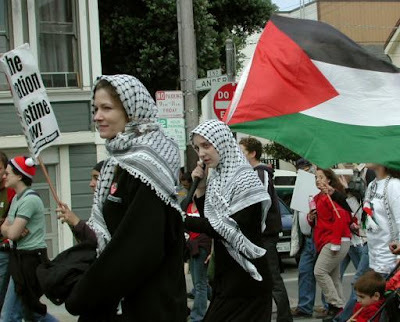 Nevertheless–Just as the Yashmag, or better known as the Palestinian scarf, has been a symbol of Palestinian resistence, the color green is now a symbol for people all over Iran. During this debate beteween Mousavi and Ahmedinejad, Ahmedinejad claimed that he hopes the Iranians will always keep their dignity. In Mousavi's "opening statemet" he retorts by saying that Ahmdinejad is undermining the Iranian's dignity by destroying Western relations, for example in such ways as denying the Holocaust. The race has gotten tighter; polls conducted by VOA News show that Ahmedinejad leading, as of June 8th. 27% of the Iranians surveyed have said they are still undecided. In a time where inflation is at its highest in Iran, Ahmedinejad is the first contendor for economic reform, and is popular among the labor party. Mousavi’s campaign has been based off of hope for a more tolerant, and reviving of the old Iranian country (Which was secular, or let’s say, “very flexible”). There have been much pressure on groups that favor reconstruction, to vote for Ahmedinejad. This includes repression. There have been reports from Mousavi ralliers of being tear gassed, to death threats for Mousavi and his followers, blocking of popular youth communication sites such as myspace and facebook, to the marginilizing of women in elections, (which the majority of them favor Mousavi for more women rights). The Iranian Election 2009 will be held this Friday, the 12th of June. The global community favor the reconstructionist nominee, Mousavi. Let’s hope the Iranians do too. I hope your prediction is right. It’s mainly why Ahmedinejad should lose, but I think you forgot a big block of voters: The labor party, and the Older population, (which are more conservative). The problem is, many people are going to vote for Ahmedinejad because he’s campaigning for economic reform and he stands up against Israel’s nuclear energy (which is more than Iran’s trying to obtain/has). The vote is really going to depend on Iran’s young adults.